Welcome to our latest eNewsletter. please let us have these to add to future eNewsletters. Did you go to this event? Couldn’t make it !! You can watch it on You Tube or if you would like a copy, you can buy it on DVD see below. 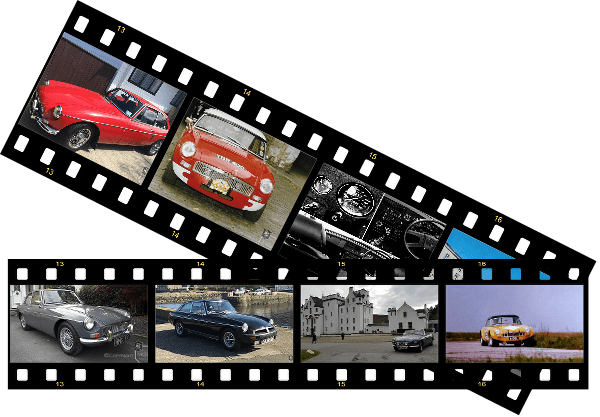 john.watson@mgb-register.org and make a BACS payment to the MGB Register for £10 quoting 2018 DVD. John Watson, 26, Lucca Drive, Abingdon, OX14 5QN. Starting at Millets farm Frilford – visiting The Classic Car Hub at Bibury and finishing the journey at Kingston Bagpuize House & Gardens. Booking information is available from here. MGB Register Weekend 2018 brings back memories. On the Saturday we visited the Midlands Gliding Club and Roger Cooper shared this short story. “When we went up to the Gliding Club I got chatting to one of the older and pretty experienced members, mentioning my brief flirtation with gliding when I was a teenager back in 1953 and was given a place on an ATC gliding course at RAF Halton in Buckinghamshire at which time I did manage to achieve my three solos to qualify for the most basic licence. The above senior member said “We have something in the hangar which might interest you! !” so he took Joan and me to have a look, and there suspended from the roof was a Slingsby T21b side by side seat trainer – no longer being used but otherwise in excellent condition. Joan was horrified to think I had “risked my life” in such a primitive looking (wood and fabric) machine without an engine. When I told her that the instructor and I had done simple aerobatics with the one I flew at Halton she was even more horrified – especially as it has an open cockpit which pre-supposes you could fall out, though you do have a petty secure safety harness. I should perhaps say that Joan does not like flying but manages to put up with it in a big jet when overseas travel is needed. 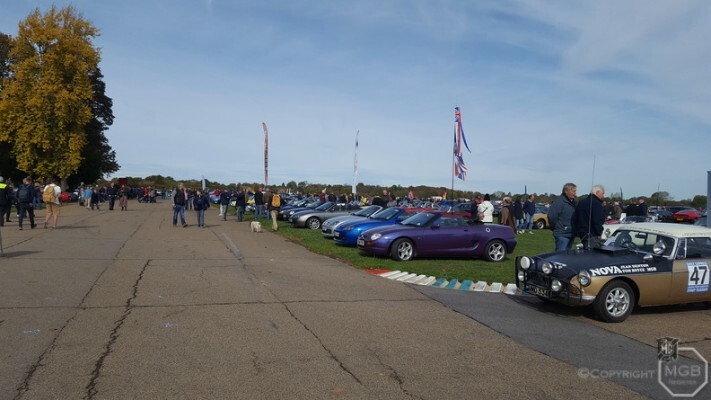 The November issue of the Safety Fast had the MGB Register Weekend & the MGB Lecture covered. Our Safety Fast Newsletter can be read in the news section of our website. Don’t forget if you want paper or digital issues of the Safety Fast magazine with lots of information and many stories from around the MG world, visit mgcc.co.uk it is included with membership. Keith Wynn bought an MGB with a Bermuda hardtop in the Summer of 1966 in late 71 sold the car. After more than 40 years, a few colour changes and approx 14 owners later in 2015 got his car back. ‘I am the owner of this vehicle which I purchased in January 2008 and since that time I have been steadily having it restored. It is now nearing completion. I am unable to find any of the cars early history from August 1967 until 1st July 1978, and wondered if there was any possibility that you could be of assistance in this matter. 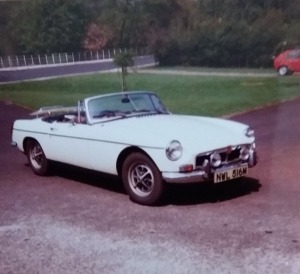 I know the vehicle was built 23rd February 1967 and was originally for display in the exhibition hall Longbridge until the 21st July 1967 when it was dispatched to Moss’s agencies limited, Leamington Spa. I would be grateful for any further information that someone might have. 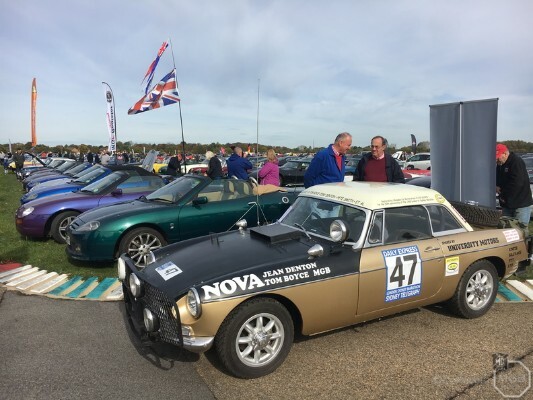 The October Bicester Heritage Scramble on Sunday 7th October 2018 was the first time we had driven the Marathon MGB for more than a few miles under its own steam, since we found it in a scrap yard in 2015. Until now the car had been trailered to all the previous events. The journey from Abingdon to Bicester was slow, as we were running in the rebuilt engine and the overdrive was not working.We discovered a couple of oil leaks from the upside down oil filter also the tappet covers, these could be fixed quite easily. As the car has no carpet and trim it was quite noisy but interesting. When on display with the other MGB Register cars visitors seemed very interested and wanted to ask questions about this very special MGB. 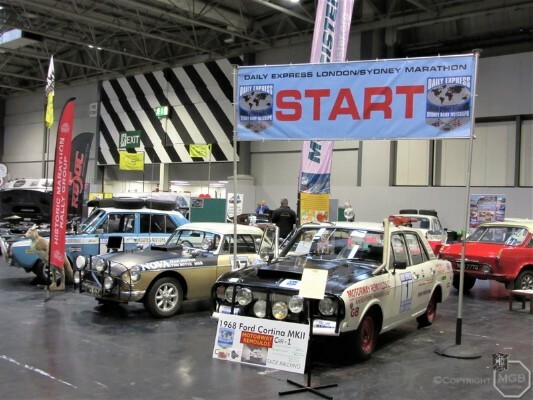 The Marathon MGB was invited to be displayed on the Historic Marathon Rally Group stand at this years Classic Car Show. 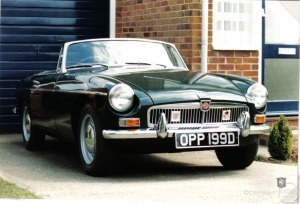 As the Marathon MGB is a runner it was decided to drive it to Birmingham this would be a real test of the car. I collected the car from Kimber House at 9am on the Thursday and started up the A34 to the Small service station before the M40. Here I was met by David Scothorn who was going to be the backup car. We then got onto the M40 and agreed to stop at Warwick Services. I started off at a gentle speed around 50mph but as I got a bit more confident with how the car drove we got up to 65mph and even overtook some lorries on the outside lane. One problem was keeping an eye on passing cars that would start to overtake and then slow up to look at this strange looking MGB. After a quick stop at Warwick we continued up the M40 our aim was to be at the NEC between 10am and 12pm. We eventually turned off at J6 of the M42 and joined the queue of display vehicles trying to get in. 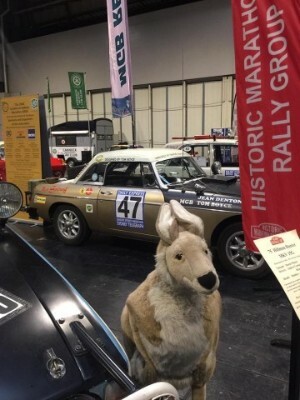 We arrived on time at Hall 8 and we were met by the other London to Sydney Marathon cars being displayed. 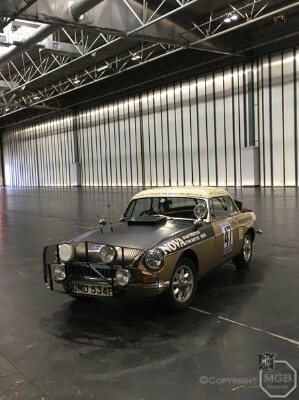 After a very successful show it was decided to return on Monday morning to collect the MGB and drive it back in daylight, Hall 8 looked massive with just 2 cars still there. 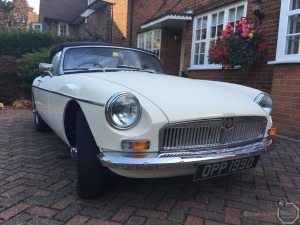 The return journey to Abingdon went well and the Marathon MGB is now on display back at Kimber House in Abingdon, if you are close by go and have a look at this very special car. A big thank you to all of the contributors for the content we use to create the eNewsletter. This month’s logo has a seasonal twist with a modified design used for the background from Freepik and we hope you liked it. Have a great time over the month of December and we hope to see you in 2019 with more news.